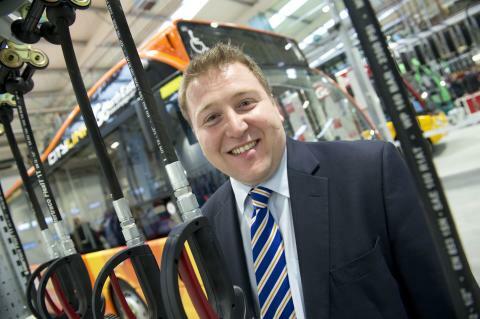 Pioneering transport marketer, Stephen King has earned Go North East recognition for industry excellence after securing a hat-trick of finalist spots at the upcoming UK Bus Awards, including an accolade for his role in leading company success. The region’s largest bus operator learned it was in with the chance of scooping awards across theLeadership and Inspiration, Putting Passengers First, and Marketing Initiative of the Year categories at a special event held at the Museum of Transport, Greater Manchester, last week. Head of commercial and retail at Go North East, Stephen was named a finalist within the Leadership and Inspiration category – the award that recognises those delivering management excellence through developing and mentoring teams, while motivating and innovating at every opportunity. Stephen, who was revealed as one of the ‘North East 50 Marketing Greats’ by the Chartered Institute of Marketing (CIM) this year, is one of only four bus business leaders from across the country up for the top honour next month. Responsible for overseeing the firm’s commercial strategy and function, in 2016 Stephen spearheaded Go North East’s hugely successful ‘£1 flat fare for 18s and under’ ticketing initiative. This bold move has made bus travel more accessible and affordable to young people with an anytime, anywhere rate, while increasing ticket sales by this age group by over 50%. The innovative initiative is in the running for both other categories in Go North East’s sights, and is just one of several transport and region firsts Stephen has brought into the business. Having joined Go North East aged 16, Stephen has been with the company for over two decades. Working his way up the ranks to become the organisation’s first head of marketing before being promoted to his current position, he leads the marketing, commercial and customer services teams and occupies a seat on the company’s Senior Management Team. This latest awards success comes shortly after Go North East was highly commended in the Large Employer of the Year category at the regional National Apprenticeship Awards, and its apprenticeship scheme won the Operator Training category at the routeone Bus & Coach Transport Awards. The UK Bus Awards will be hosted by BBC News presenter Jane Hill at the Troxy, in London’s East End on 21 November.